Hi gals, thought I would give you an update on my health situation. I am on the mend, do not have an infection, hooray. Just taking a bit longer to recover, I keep trying to do things around the house and it puts me back on the sofa, grrrr!!! So I am still trying to take it a bit easy. But getting better. I have had some of these dollies somewhat finished before surgery and decided, (since I can't drive or do much else) to finish them up. This is Helga Witch and she is to be listed on Lemon Poppy Seeds tomorrow. Her smile kinda reminds you of the Grinch huh?!? You can see the full version of her July 1st Thursday. 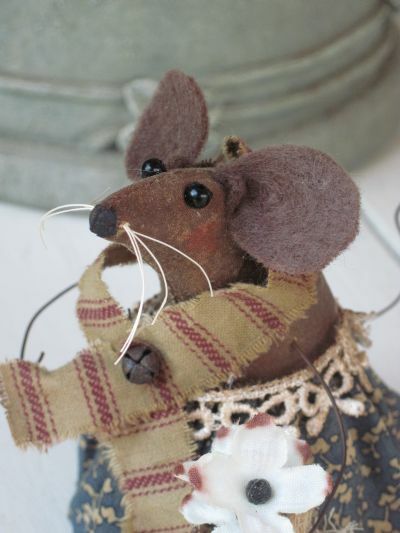 This is Tilly the Field Mouse. Sooooooooo loves her flowers, the field has so many to chose from but these will do today. She too can be found on LPS July 1st. Suzie the Field Mouse is almost 5" not including her tail of course. She loves going to the field to pick flowers and she can be found on LPS July 1st, tomorrow. Please pray for me gals. My surgery went well my recovery not so good. I had a neck injury some years ago and laying around has caused me constant headaches, back aches and with taking the medication to help ease the head ache pain, everything tastes horrible. I will contact my doctor this morning and try to figure this out. My meds make me very sleepy, but if I don't take them, I can't get rid of my head aches. Grrrrr. Yes it is true. I survived my surgery. Was it pleasant well as pleasant as surgery can be. I am happy to say that the cyst was on the outside of my ovary instead of inside. Which means I still have both my ovary's and they look. Good. Forgive me if this is a little loopy here and there. I won't be on long. Whoever said that government run health care was a great thing to do??? Okay let me explain. Since my husband has been unemployed and we have no healthcare, I have had to go to Social Services to see if I could get medicaid, grrrr. What a nightmare that was. I love standing in the rain for 1 hour and waiting to get a number then waiting to be called to get an appt. ticket ugh (hopefully, many were turned away that waited with me,, they had to come back the next day). One lady had been there 3 times, she was in a wheel chair. Then back to my doctor's office with the slip (I was originally turned down from medicaid the first time) that says I have medicaid. Now don't get me wrong, I am appreciative that I have medicaid. I don't want it but at this time I have no choice. It is having to trust a person I DON'T KNOW FROM ADAM to make that decision for me (because I guess I'm not capable neither is my doctor anymore) on weather I should get surgery or not. It is true that I am going tomorrow June 17th. So I ask for prayers, know that I will not be blogging or visiting for several days or a week. That I will miss visiting with you all, but surgery calls and that grapefruit sized cyst HAS GOTTA GO!!! So with that said I will say "see you soon and happy creating"! Can't wait to get back here and see what all you gals have been up to. 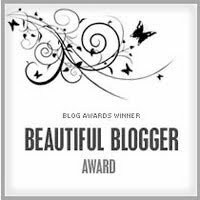 Wow I am so very honored to receive this wonderful award from Jan at www.jansartyactjourney.blogspot.com. She was so kind to give me one of these fabulous awards and God bless her she gave it to me earlier this week and I being partly senile (hee hee) totally spaced it. OMGosh!!!!!! I am supposed to tell you ten things about myself. Well, lets see if I can remember. LOL! 2. I love mixed media art and wish oh boy do I wish I had more time to dive right into it. It is so exciting and freeing to me. Talk about self expression! 3. Oh,no I'm forgetting already. Ugh! 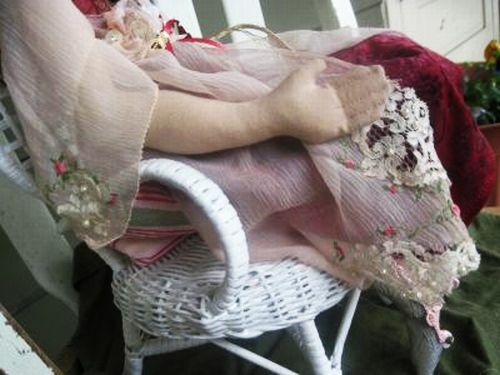 Oh yeah, um I love vintage textiles, hankys, lace, table scarfs, doilies anything old and vintage will do. I love to work with them and have quite a stash. Oh I have all my ideas for those, if I could just get them out of my head and onto the sewing machine, wow. 4. Fairies have always been my favorite doll, yes really. Maybe you find that strange since I have done prims for so long. 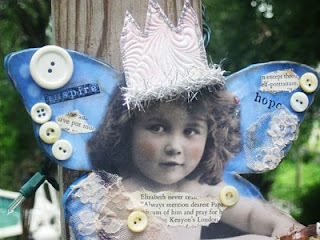 But it is true and I am working on my first fairy art doll as we speak. 5. Love birds, butterflys, sparrows, kitty cats, dogs (have two) and HORSES. 6. Glitter is fastly becoming my best friend. 7. Love the Lord Jesus although I put him in the back seat WAY TO OFTEN! 9. Love you wonderful gals who visit me and are willing to open up about your lives freely, that is dear to me. 10. Would love to never leave my art room ever, just for food. If I had a bed up there and a fridge oh boy, what bliss that would be. Jan, thank you for your kindness and being so sweet to share this with me. 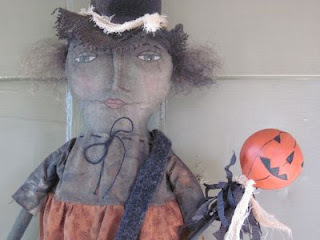 Please don't hesitate to (cut and paste her address) and visit her right away at:www.jansartyactjourney.blogspot.com. You won't be disappointed EVER! 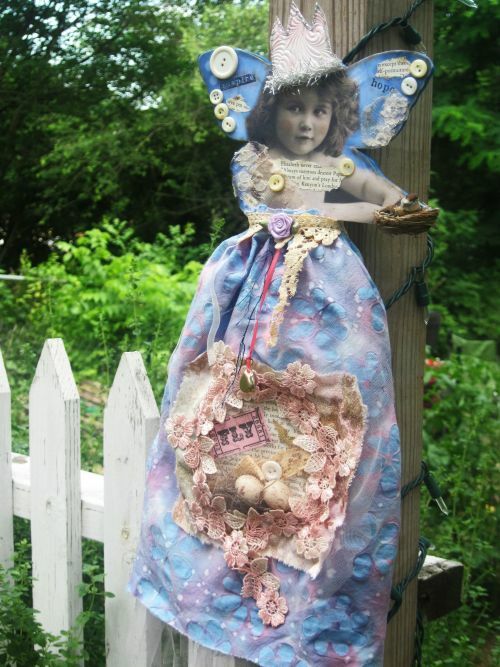 I decided to revamp this sweet mixed media fairy. I was not happy with the original way she looked. So I took off her little rag cap and made her a crown. She has a darling face doesn't she. This is her story. "She carries the nest ever so sweetly. Careful not to tip it in anyway. Sweet is the song her bird sings and she must put the nest in the safest of places. Bella flys to the highest branch and gently places her sweet bird and nest securely on it. She whispers "stay safe sweet bird" and flys to her home in the deep woods. All that matters to her she carries in her pouch. Tiny treasures of old and new. 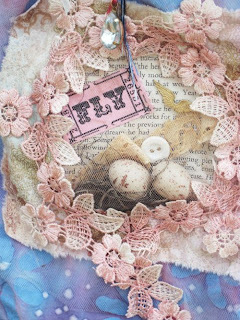 A bit of lace, a gold wing, a sweet story page, two eggs and a ticket to fly away. Each treasure is from a special place that she holds in her heart till now." This mixed media piece is on my Etsy site (go to side bar and click on Etsy site). She is made of wood, fabric, paper, is stamped, buttons, antique lace and more. 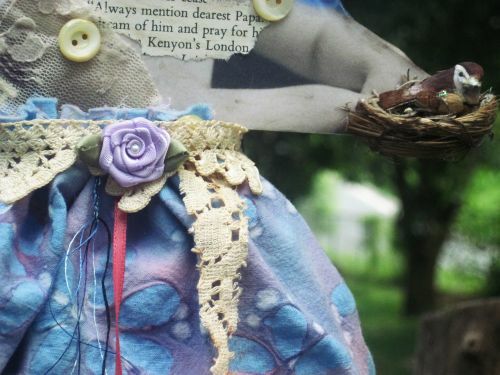 Loved revamping this piece, she is now ready to fly away. For sometime now, my heart has been leaning in another direction regarding my dolls. 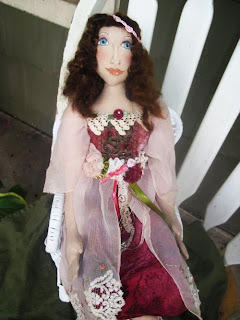 I have been creating prim dolls for over 15 years now and even though I enjoy creating them, I have become burnt out. I have collected vintage hankys, doilys, and whatnots for years now and have never really used them much in my work. But I got a brain storm not to long ago to use these wonderful works of art and some of the little vintage dollies on the side bar was the start of my journey for the vintage styled doll. This is a side pic of her dress and vintage hanky, I sewed each pearl on by hand. Loved how it looked. This hanky was a perfect size for the doll. I used the extra for her sleaves, whataya think???? 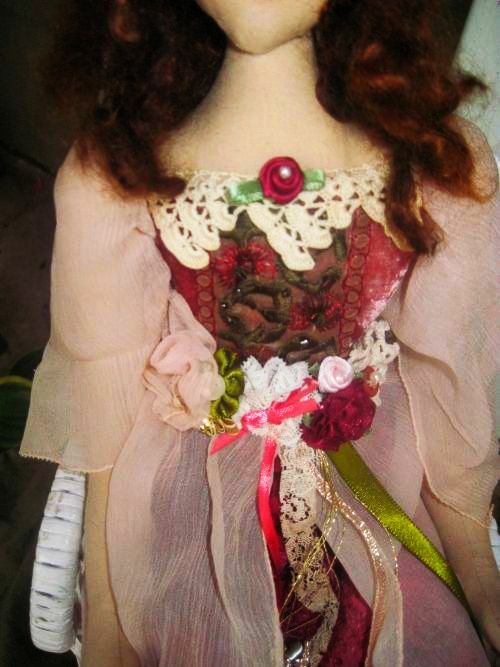 The pic of her bodice is my daughter's old crushed velvet coat and I sewed the green and red lace on the front too! Some of the flowers were handmade by me as well. 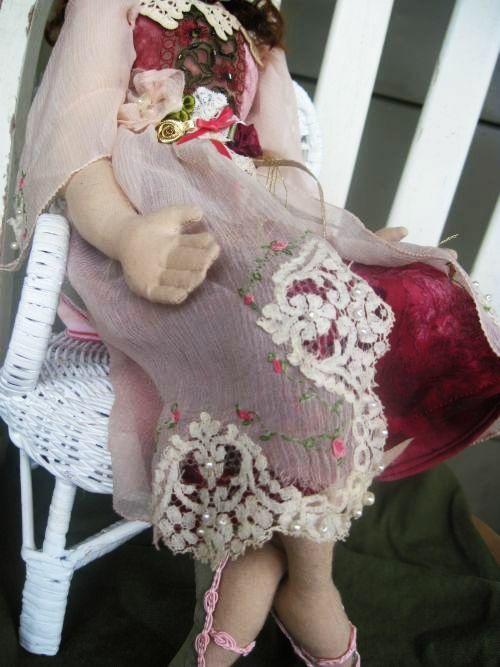 I plan on giving this dolly to my mom since my daughter's fabric and heart charm from a jacket was used. It is her belated Mother's day present. She new it was coming late, but I wanted to take my time on it for her. This is a new start into another area of doll creations and I am very excited to work on more. I hope you all like what you see, because more is a coming. 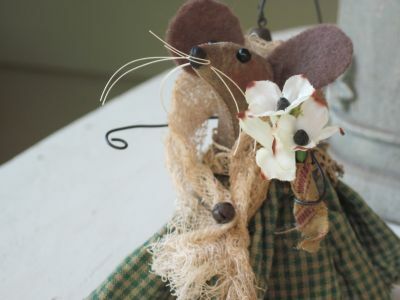 I will also be creating fairies too, love those little faes. I have a few hiding in my garden. They only come out for nice people. So if you stop by, they will visit with each one of you. Why you say, because they know you are kind and creative. Have a wonderful, creative day. 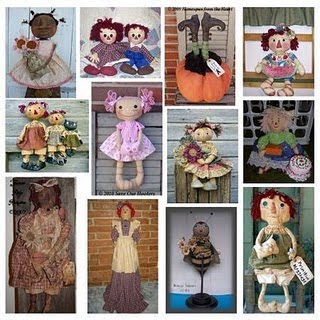 For those of you who love to sew and love Annies and more, Bette from "Bettes Tomorrow Treasures" is giving away all these wonderful patterns, kindly donated by some wonderful prim artists (including me!!!). So check her blog out and sign up for this great giveaway. To check it out and sign up, go to the right of my blog and down to Bettes Tomorrow Treasures and click on it to sign up. Good luck. So sorry gals I have not visited your blogs and posted on mine. I have not been feeling well lately. 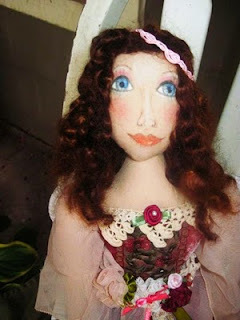 But I have also been learning some new ways to make dolls and have been working on them nonstop. So my head has been elsewhere. My son has also been ill off and on, so it has been very difficult to keep up with everything. I hope all of you are well and please know you are in my prayers and thoughts.